The hardest thing for many successful creative entrepreneurs who built businesses on their own talents/methodologies is how to scale. This is especially true when part of how you work is your own intuition and flexibility- but Tanya has cracked the code with 10 branches across the tri-state area and today she shares with us how we can do it too. 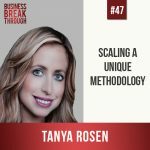 As a bonus, Tanya gives some great tips on how us “chair glued” entrepreneurs can stay healthy while leading a (very) sedentary lifestyle. Marketing for Marketers: Free Intro! For more information and for a link to the free sample class, please fill in your name and email below. 77 strategies to promote your business on a limited budget. I’m ready to take a steady salary for my business!